Here’s a recap from the email I sent out last week: If you know you will not be able to pickup, please login to your farmigo account (you created one when you signed up with us) 48 hours in advance and make changes so we may plan accordingly. It is your responsibility to remember your box. Unclaimed boxes are donated locally, or if it’s been an extra hot day, dumped to the livestock. Asking us to make up a forgotten box is the same as asking for double. Please pick up during your time frame ;). Asking for another box because you forgot is the same as asking for double. I know that might sound rough…but it is true and it has happened. You MAY have these things: strawberries, lettuce, beets, chard of some color, peas of some type, and perhaps something else green. We grow many varieties of lettuce, beets, kale, etc. Check out the blog for details, or post to facebook, if you are unsure. The greens have only been rinsed, but we leave the fine cleaning to you! None of them have been sprayed (this will be obvious at times with little pinholes from the flea 2qA@QqbeetlesL). Please pick up your box every week, return your boxes without destroying them, read your letter, email us with questions (after you have read and re-read your letter ;)), login to your farmigo account to make contact and pickup changes, and have fun with all the goodies! Farm Dirt is where you will read about what is happening at the farm, wildlife sightings, our family, etc. Bears, bobcats, many bluebird families, turkeys and deer are busy on the farm. The tree frogs pipe up at any time of the day and sometimes are deafening. The toads and all the other frog sounds fill the late afternoon and night. Butterflies and assorted wasps and bees are everywhere. It’s awesome. The hops are at the top of the wire and growing; we added a few more varieties this year and have quite a bit ready to use in the freezer (please ask if we should send some into you). The row crops are looking awesome and I could not help but take pictures of the lettuce in the field yesterday. There is TONS of stuff planted all over the farm and all we can do now is pray for normal (read not extreme) weather. We encourage you to become part of the farm and be connected to your food and farmer; visit, check out the crops, sample in the field, picnic, watch the birds, amphibians, and insects! Yes, wash everything 😉 Preheat oven to 400°F. Wash and trim the beets. Chop in halves or quarters if the beets are large. Place the beet pieces in roasting pan. Add about 3 tablespoons of water to the pan. Drizzle a tablespoon olive oil on the beets and sprinkle with coarse salt if you like. Cover the pan with foil and put into the oven. Separate the fennel bulb from the stems. Thinly slice the fennel into 1/8th inch slices. Place the slices into another roasting pan. Drizzle a tablespoon of oil on the fennel. Cover the pan with foil and place into the oven. Bake fennel for 20 minutes covered and 10 minutes uncovered. The slices should start browning at the edges. Bake the beets till they are easily pierced by a knife; about 30 – 45 minutes. Chop up the leaves of the fennel – about 1/2 cup. Mix the cooked fennel and beets together with the dried thyme. Place beet mixture on top of a bed of mixed greens or lettuce. Sprinkle the fennel leaves on top. Serve with a vinaigrette dressing, like: ½ cup balsamic vinegar, ½ cup olive oil,1 TB Dijon mustard, 2 teaspoons salt, and 1 teaspoon pepper. This is great with oranges and or goat cheese too! The onions are all growing, the tomatoes are all seeded and many varieties are actually being transplanted this week, the geraniums are looking really good and the pansies have been moved to a cooler section of the greenhouse to grow on. We’d like to think about moving them out, but with the 8 degree nights and the screaming wind, we won’t be thinking to long about it 😉 Freezing solid is not the kind of hardening off we are looking for. I am super excited about the plant collection this season and know all of our gardening friends out there will NOT be disappointed. I cannot wait to see some of the new peonies in bloom! There are some amazing new colors in petunias, some different begonias, and as always, several new tomato varieties. Then there are the All American Selections in Sunpatiens, Bounce Impatiens, peppers, tomatoes and more! We are still working on our final plans for the Boston Public Market and are excitedly planning for it. We’ve got some great ideas for new displays, and signage. There will be improvements that will benefit all our customers. It’s exciting and a little stressful. We will be hiring retail help for the Boston Public Market opening in June; if you or someone you know is (or will be) looking for year-round work, has retail experience and an interest in great food, please contact me. I will be advertising the job soon, but would rather hire within our group. I am super excited about the people who have responded! We’ve got a couple new calves that are adorable! We have more on the way and, hopefully, the weather will be a little nicer for Mom’s AND babies. It’s been a tough winter for them too, but they seem to manage better than some because of their breed. The Belted Gallaways are a heritage breed that is intended to live on grass alone and they have more hairs per square inch than most other breeds, so they tolerate the cold better. The yard is slowly filling up with Blackbirds and we have spotted our first Turkey Vultures. I have been told that vultures probably don’t excite anyone, but for us, we know they are a true sign of Spring. Another great thing about vultures is they perform a very necessary job around these parts; with the amount squirrels, chipmunks, opossums, mink, weasels, fox, skunk, rabbits, birds, etc, hit by cars, the roadsides would be a stinking mess. So, let’s hear it for the super ugly creatures doing a great job cleaning up after us! The turkeys and deer have finally come out of their winter yards. It had been to treacherous to come out when the snow was so deep – the deer sink up to their bellies while the coyotes and bobcat can walk on top of the snow. The deer don’t have a chance of escaping predation against that. Wow! Where did the off season go? Here’s January News as sent via email earlier today. Such a busy time of year for us! Most people would think we have nothing to do and go on vacation, right? We have spent countless hours plowing through seed and plant catalogs, placing orders, and doing general research to ensure we have the most amazing selection of vegetable, herb, annual, and perennial plants AND actual fruits and vegetables. We know you expect a mind-boggling variety from us and we love growing it! Some plant winners from last year you will see again: Carmen Italian frying peppers, Mama Mia pepper, African Sunset petunia, Sunsugar cherry tomatoes and, of course, all the awesome wave petunias, and a tomato selection that cannot be outdone. As for actual food, everyone loved the snow peas, Mama Mia peppers, dried beans, Ghost peppers, and, of course, we’ll be back with all the regular crops like peaches, berries and artichokes. Glenn is hoping to expand the artichoke supply this year – it’s a lot of work but so worth it! Yes, all this is Conscientiously Grown, that’s our commitment to our family and yours. That means no GMO/GE! I would like to ban genetically modified anything from our town so we would not worry about pollen moving. Do you think that is possible? Anyone know how to go about such a thing? If you haven’t “liked us” on Facebook yet, it’s been a handy way to keep folks updated on whatever is going on at the farm, markets, etc. Like us today. I mentioned last month that it is time to order next season’s CSA and market bags. I have not decided if the design will change or the color of the bag. Anyone have a preference? We will also have the new Boston Public market venue where we will be selling Stillman’s swag alongside our plants and produce. Should we have a Stillman’s T-shirt contest? Is there interest out there to design a shirt or bag for us? Let me know. There are several projects scheduled in connection with the Boston Public Market. These will be improvements that will benefit all our customers. It’s exciting and a little stressful. We will be hiring retail help for the Boston Public Market opening in June; if you or someone you know is (or will be) looking for year-round work, has retail experience and an interest in great food, please contact me. I will be advertising the job soon, but would rather hire within our group. The bottom of the kraut crockI had to bag up all the sauerkraut this week. Mold had started to form on the top, so I scummed that off and bagged up the rest for the freezer. Naturally, I reserved a large tub for the fridge and we had Reubens and then a huge pan of kraut, kielbasa and taters – YUM! My girlfriend announced she wasn’t a fan when I offered her a taste, but after the first forkful, she was hooked and ate a bowlful. What a great use of surplus cabbage. I got Glenn a wildlife camera for Christmas and we set it up in a barway into to the orchard. One day after a light snow, I went down with much excitement. I saw rabbit tracks, fox tracks, coyote tracks and some other track I did not identify. I raced up to the house to see the pictures on my computer. NOTHING! OK, well that’s not entirely true; there was a cool nighttime picture of the trees and a couple daytime pictures of the cornfield. Due to the unbearable cold wind the past week (and my depressed annoyance), I have not put the cam back out. We’ll see what tomorrow brings. I really hope to be posting cool pics of the creatures we share the farm with. I spotted one of the Bobcats this week. He/she darted out in front of me on the road, crossing from one field to another. Perhaps I should mount the wildlife cam on the front of my car? 😉 The Bluebirds were busy in the pasture today. It had opened up a little after the rain last night; I hope they were all finding tasty things to eat. The severe cold has wiped out most of the food stuffs around here, so I am glad when the birds can get to the open ground for a spell and fill up. Glenn always leaves several pieces of corn standing all winter so the larger birds and animals have feed. The volume of turkey tracks in the cornfields is tremendous! Glenn has been clearing out some hedgerows. We use this wood to heat the house and we chip the brush to mulch the blueberries. The new found space will be for hops or pears. This is not a new concept, the early New England farmers often planted the edges of fields with fruit trees. It was a perfect use of land that could not be tilled or pastured and the trees provided a little shade for the weary worker or livestock. Thank you for all the sign ups! As you know, we are busy ordering seeds and such, so the cash flow is great! The seed companies offer cash discounts, we order our bags, the reusable bags, and so much more. CSA sign ups help the cash flow of running a farm. Please consider signing up now to not only continue with the year’s plans, but to secure your food supply too! For those of you who have participated in CSA with us, you know your strawberries are secure. I think we have the most customer requests for buying the berries we have set aside for our membership. How cool is that?! It is important to know that CSA benefits the farmer and the member at Stillman’s. For those who have already signed up – thanks! City Hall will move to the Boston Public Market location. The signup is very simple, just follow the prompts and at the end you can opt for a CC payment or a check. Thank you so much if you have already signed up for the summer CSA. If you are renewing, the new farmigo system should recognize you when you login. If you are new to the system, it is very simple, you will create an account and you can log back in anytime to update your info, switch pickup dates, make payment…. Sign up today ! A great CSA haul picture from member Jessica! Melt the butter in large skillet over med-high heat. When the foam subsides, add the apple and cook until just beginning to brown, about 5 minutes. Add the cider, thyme, caraway seeds and simmer until the cider is slightly reduced, about 3 minutes. Add the cabbage, stir to combine, cover and simmer until the cabbage is wilted but still bright green, 7-9 minutes. Season with salt and pepper to taste. Peel and dice potatoes and onions. Clean, trim and slice kale. Add the potatoes, onion, kale, a bay leaf, a pinch of salt and just enough water to cover all in a 3 qrt pan. Cover and boil gently for about 25 minutes. Meanwhile steam the smoked sausage for the same amount of time and slice. Remove the bay leaf, drain the vegetables, and mash them. Add milk and butter. Stir in the hot, sliced smoked sausage, add salt and pepper to taste. I have made by frying A package of our ground pork in about 5 slices of bacon and then adding that to the whole kale potato-mash. It is very satisfying! Mince and mash garlic to a paste with kosher salt using a large heavy knife, then add anchovy and capers and finely chop. Transfer mixture to a large bowl and whisk in lemon juice and pepper, then add oil in a slow stream, whisking until combined well. 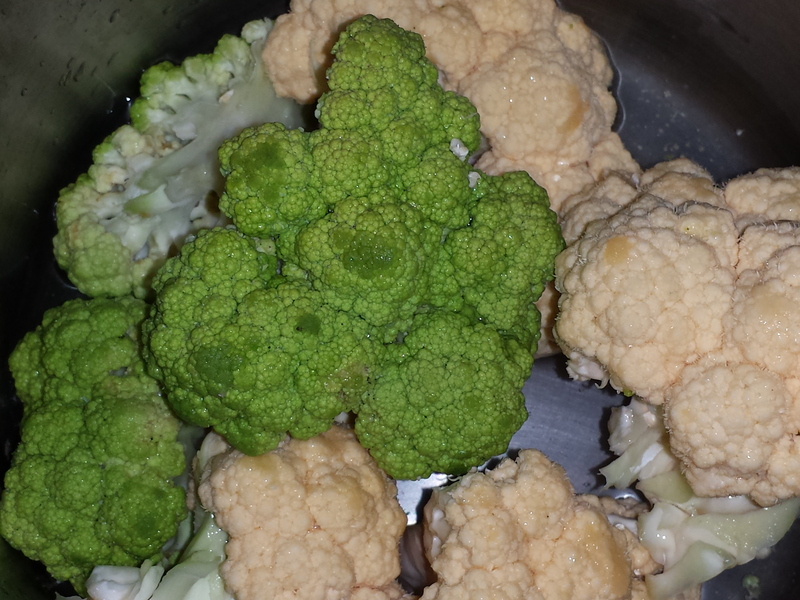 Cook cauliflower in a 4-quart saucepan of boiling salted water until crisp-tender, 4 to 5 minutes. Drain well in a colander, then toss hot cauliflower with dressing. Cool to warm, tossing occasionally, then add parsley and toss to coat. Serve immediately.